IRVINE, Calif., February 1, 2017 – A breaching whale. A falling tree. A charging rhinoceros. 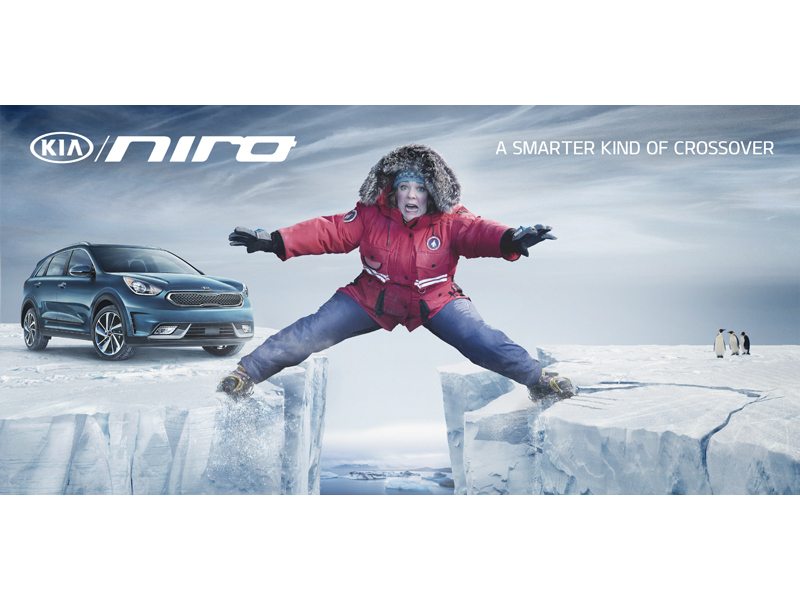 These are just some of the extreme challenges Melissa McCarthy faces in Kia Motors’ Super Bowl ad for the all-new 2017 Niro crossover. Debuting online today, “Hero’s Journey” is scheduled to air in the third quarter of the big game and finds McCarthy – who is only “trying to help” – braving the open ocean, climbing high up into the treetops, and traveling in the Niro, the most fuel efficient crossover in America1. With a hilarious and courageous leading lady who is ready, willing and able to pitch in and do her part for just about anything, “Hero’s Journey” is fantasy adventure at its finest and the centerpiece of a multifaceted campaign showcasing the all-new Niro as a no-compromise package combining driving enjoyment with eye-catching design, functional utility and record-setting fuel economy. Created by David&Goliath, KMA’s advertising agency of record, the spot will entertain across multiple platforms before and after the Super Bowl. “For years, I’ve been trying to find the perfect project that combined the real threat of me breaking every bone in my body, with my desire to help save the environment. Thanks Kia!!! XOXO Love, Melissa,” said McCarthy. As part of the spot’s rollout, Kia was the first advertiser to debut a Super Bowl commercial on Facebook Messenger. During the big game on Sunday, consumers engaging with the interactive NiroBot for Messenger will have the opportunity to win MPGs (“Melissa’s Precious Gear”), including more than 40 props and assorted items from the set of the commercial. A key component to Kia Motors’ Green Car Roadmap, the Niro strikes the perfect balance for today’s consumers and stakes claim to a unique position between the hybrid-electric vehicle and CUV segments. As part of Kia Motors EcoDynamics philosophy, the Niro represents an important next step on the path to nearly tripling the brand’s global green car line-up by 2020. A plug-in hybrid powertrain is due to be added to the car’s line-up later in its life-cycle. Headquartered in Irvine, California, Kia Motors America is the marketing and distribution arm of Kia Motors Corporation based in Seoul, South Korea. Recognized as one of the 100 Best Global Brands and 50 Best Global Green Brands by Interbrand, Kia proudly serves as the "Official Automotive Partner" of the NBA and LPGA and offers a complete range of vehicles sold through a network of nearly 800 dealers in the U.S., including cars and crossovers built at North American manufacturing plants in West Point, Georgia* and the municipality of Pesqueria in the state of Nuevo Leon, Mexico.